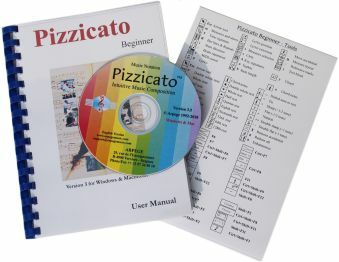 Pizzicato Beginner contains most of the tools needed for choirs, solo instruments and small ensembles, up to 16 instruments. 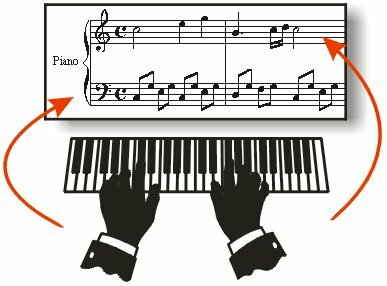 With the progressive manual and the Internet videos, you will be able to create and print beautiful looking sheet music. An extensive and easy to follow tutorial helps you mastering every aspect of Pizzicato. Play or sing while listening to the score at any tempo to improve your skills and rhythm. Learn or review music theory and start practicing the music keyboard. 4 - Your advantages - Why choosing Pizzicato? The detailed and progressive tutorials help you to use the software. Display the on-screen contextual help with a single key. 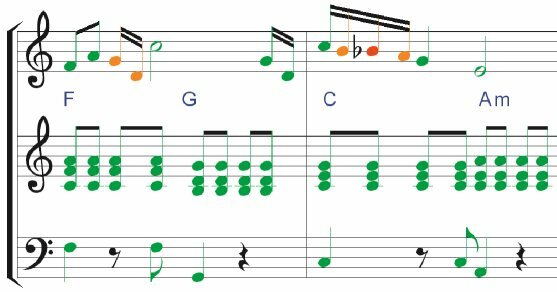 The detailed music tutorial helps you to understand music notation or review music theory. 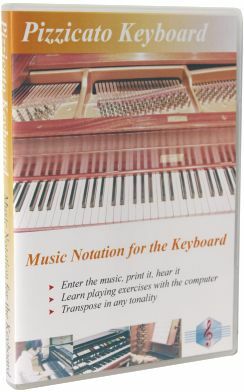 Exercises wil help you to play simple music scores on a music keyboard. Display the note names automatically. Pizzicato will help you to read a score. Sing or play your instrument while Pizzicato is playing the score as a reference for rhythm and pitch. Change the tempo according to your progress. 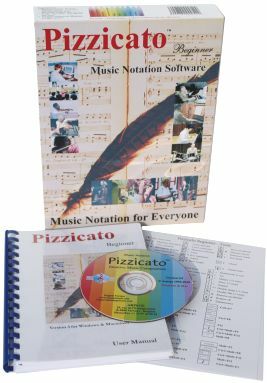 Just like you create a letter with a word processor, Pizzicato gives you the tools to write, print and hear your music, whether for the soloist, the choir or the small ensembles up to 16 instruments. 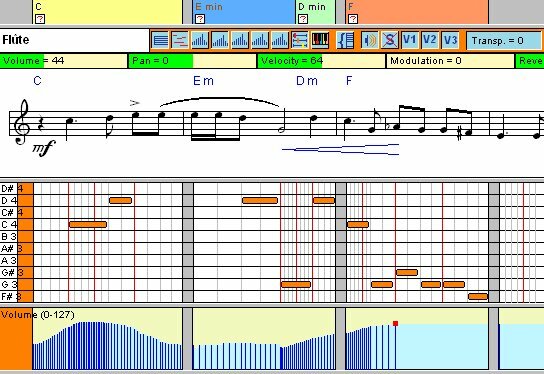 You can enter the music with combination's of mouse clicks, tool palettes, keystrokes, the virtual piano keyboard, the guitar fret board window, or directly through a MIDI keyboard, step by step or in real time. The music notation is automatically spaced correctly. You can then zoom in and adjust any aspect of the music notation at any time. You can add accidentals, tuplets, chords as well as many other standard or custom symbols and hear their influence on the playback of the notes. Select measures and use the copy/paste function, for instance to duplicate measures or to transpose a melody without the need to rewrite it manually. You can use and manipulate up to 8 voices per measure. You can enter music by playing the notes in real time at your tempo, on a music keyboard connected through a MIDI interface (for instance MIDI/USB interface). Pizzicato displays the score and you can make any correction you want and split the left and right hands on two staves. 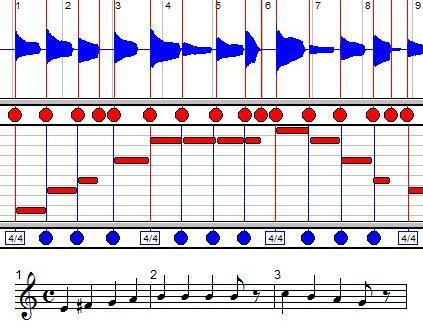 You can edit the notes graphically as on a piano roll editor. Music notation is adapted accordingly on the staff. Enter the notes with the help of a guitar fret board window, showing the name of the notes. Using this entry mode, you can select the rhythmic value of a note just by moving the mouse to the right for longer duration or to the left for shorter duration. You can encode simple music with only the mouse. There is no need to select tools on a palette or to use the keyboard. A similar mode is used to enter the notes of an existing chord progression, on one or more staves. A simple but powerful note entry mode to translate chord symbols into real notes. 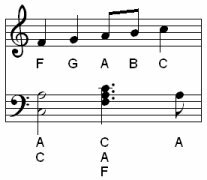 You can use the G and F clefs, standard or transposed (8). Change the clef anywhere in the score. Select the key signature (number of flats or sharps at the beginning of the staff) and change it anywhere in the score. You can transpose the score from one tone to another, just by changing the key signature or by selecting an interval. 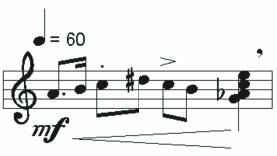 Specify the number of beats of the measure with the time signature (4/4, 3/4, 6/8,...) and change the time signature anywhere in the score. 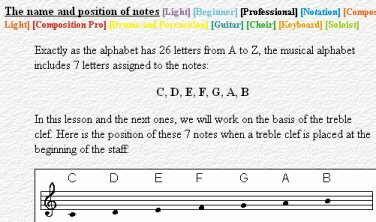 Add chord symbols and convert them automatically to notes on the staff. Add a title, the composer name or any free text associated to a page or a measure. You can enter the lyrics just by typing in the text syllables and Pizzicato will place them nicely centered on the notes, up to 8 lines of lyrics per staff. You can even copy the lyrics from the text of another program (Word, Open Office,...). You can adjust the position of lyrics and change the font, size and color of each line. 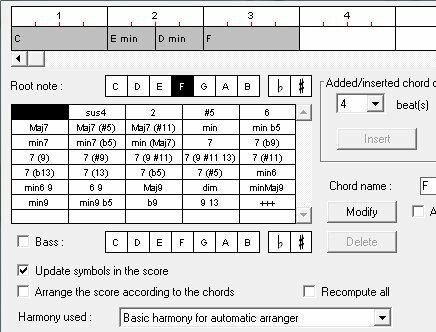 Use the chord progression window to enter or edit the chords easily. 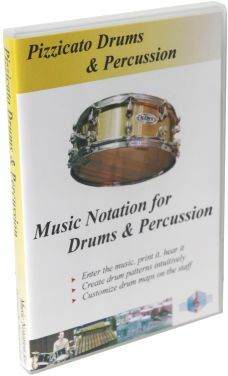 Adjust the page layout, customize the number of measures for each staff or more generally, layout the music as you want it to look on the page. Insert images and graphics in the page layout of the score. 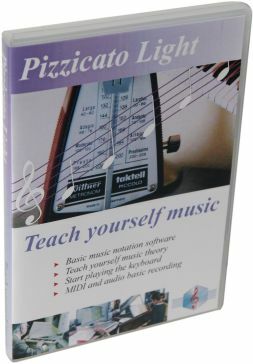 You can write music tutorials and exercises books directly in Pizzicato. You can print in any paper format, including booklet printing. Pizzicato contains all the tools you need to write sheet music for the guitar or other fretted instruments like the banjo, the bass, etc. You can enter the music with the mouse on a tablature or TAB staff or on a standard staff. You can display both staff and TAB or tablature and Pizzicato can convert from one to the other. A customized library of 240 fretted instruments is available and you can ask Pizzicato to design a chord diagram library with specific features like the position on the fret board or the number of strings used. 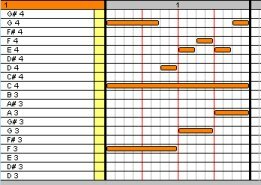 A full library of chord diagrams is available, and you can add your own to complete the library. 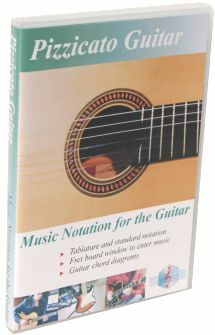 A set of specific symbols for the guitar may be added to the score and they will affect the performance of the playback. Assign colors to notes, based on the note names, the pitches, or individually. With an existing chord progression, you can intuitively design a melody. Pizzicato can display the score so that the notes being part of the current chord are displayed in green, the notes of the associated scale are displayed in orange, and the other notes are displayed in red. With this system, green notes are the strongest notes for building the melody, orange notes may often be used as passage notes and red notes should be avoided, except for rapid chromatic passages. It becomes easy to design a melody on a chord accompaniment, because the note colors help you to select the best notes. 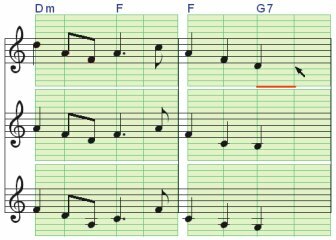 You can test and try many possibilities by moving the notes or changing the chords and seeing the note colors being adapted. 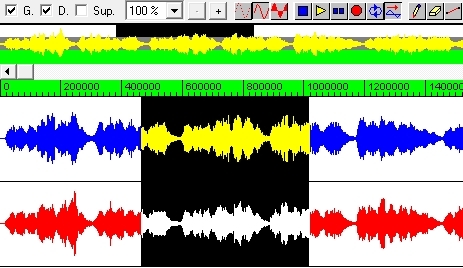 Pizzicato can now convert an audio file (WAV) into a score. Play a melody on a flute, guitar, piano,... through a microphone and Pizzicato can help you to transcribe it into music notation. This new function also helps you to transcribe audio polyphonic files (several notes together), even if it is more delicate to work such files. While entering or editing the notes, you can hear them. You can play the full score or any part of it, starting at any measure. You can even play a section in a loop and still continue to edit the score while Pizzicato is playing it. You can watch the notes colored as they are played. The playback takes into account the tempo, accents, nuances, and special effects. Select the sound you want for each staff of the score. Add sound effects by drawing a curve in the effects view, for instance to add the precise shape of a glissando or a crescendo. 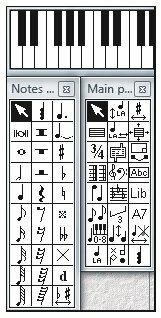 If you have a MIDI synthesizer, you can connect it to the computer through a USB/MIDI interface and Pizzicato can play the score by using the sounds of your synthesizer. You can use up to 16 MIDI input/output ports. 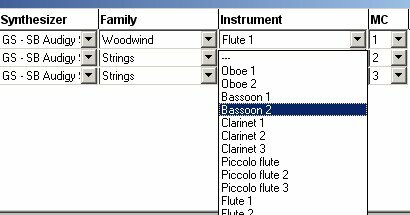 Select the sounds assigned to instruments on the staves by using the standard GM/GS/XG lists of sounds. This view is designed to provide you with the most advanced editing tools of Pizzicato, all in one window, for your convenience. You can edit the music notation directly, edit the notes graphically as on a piano roll, you can draw effect curves to create a customized crescendo and have access to most controllers and tools. You can synchronize an audio track, select instruments and edit the chord progression and associated scales. You can select the staves to display and for each one you can choose the editor(s) you need (notation, graphic, effects,...). A set of 10 memories can be used to store different configurations and switch between them as you work on different parts of your composition. You can add one audio track and synchronize it with the score. You can record an audio track to add an acoustic instrument, voices or sound effects. With the audio editor window, you can directly edit audio tracks. Operations like copy, paste, mix, echo, fade in & out, insert, remove, time inversion, and many others are available to edit the sound itself. 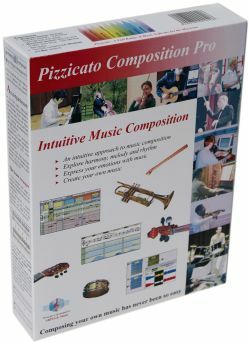 Pizzicato includes a licensed version of the PapelmediaTM Sound Library, with 1.2 GB of audio samples for a realistic sound rendering of your music. This library is not included with the demo version. You can assign these sounds to any staff of your composition. 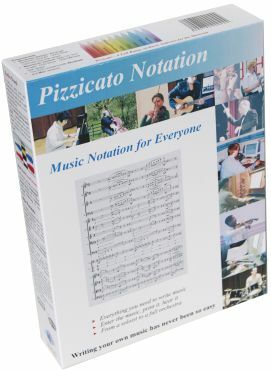 You can create a standard MIDI file from any Pizzicato score and import MIDI files from the Internet or from any other music software and edit or print the score. You can also export MusicXML files to exchange music scores with other music software. You can export a page or a few measures to a graphic file (BMP) and use this image in a word processor or graphic software. 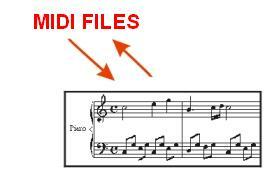 You can create an audio WAV file from any Pizzicato score, using the full quality of the integrated library. You can create an audio file for the full composition and also a separate audio file for each instrument. You can use these audio files to create a CD with your music compositions. Your Advantages - Why Choosing Pizzicato? 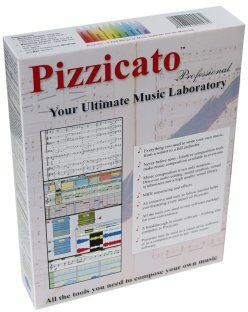 Whether you are a beginner or professional musician, Pizzicato offers you an easy and user-friendly approach to creating music with a computer. 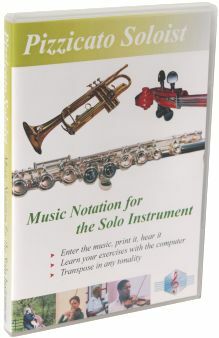 The music course and software tutorials do not require any music or computer knowledge. They are surprisingly simple to read and apply. 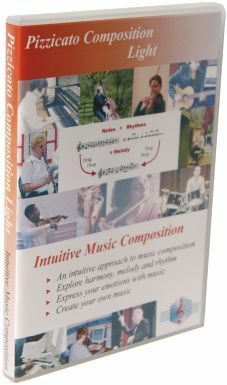 It contains a full music theory course, with many examples that combine with the discovery of the tools to enter music. You can then directly apply what you learn in practice. 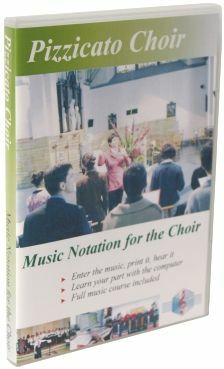 With it, you will be able to understand music notation. 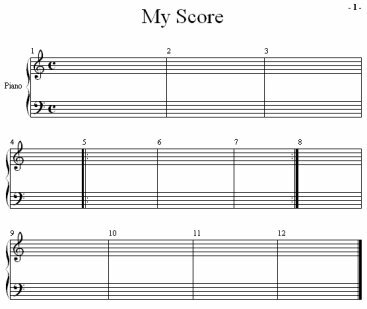 The step by step tutorials show you how to write a score, with many examples. You learn how to use each tool so as to be efficient and save time. Pizzicato offers free and unlimited technical support through the Internet or email for any question you may have while installing or using Pizzicato. You can always email technical support from the editor of the software. This guarantees clear, efficient and customized answers within 24 hours during business days. A user forum, a database of frequently asked questions (FAQ) as well as many tutorial videos are also available through the Internet site 24/7. 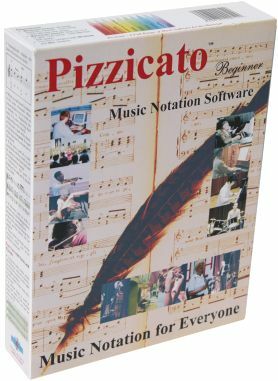 When you buy Pizzicato, you are entitled to receive two free major upgrades of the software, by download.